Showing 13 articles from January 14, 2014. Photo Courtesy Sheriff's Office Deputy Justin Kangas and Ciko are attending a 10- week, 400-plus hour K-9 training academy. Deputy Kangas and K-9 Ciko will be ready to attack the local crime scene in March. 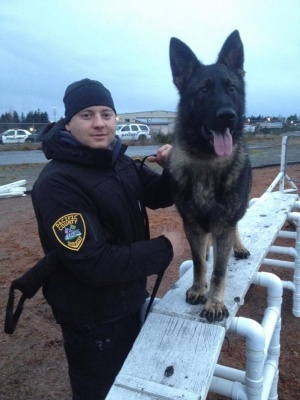 SOUTH BEND – Ciko is the newest member of the Pacific County Sheriff's Office. SOUTH BEND – Like the local economy, the local police beat has been slower than usual with a lot of crimes. But there still has been a significant number of arrests in the fight against methamphetamine. And, Pacific County Superior Court remains as busy as Grand Central Station with drug cases and other crimes. Methamphetamine court cases and arrests have been very prevalent of late. Willapa Valley's Matt Konigsberger drives and dishes against the tough defense of Raymond's Kason Koski at Tenoski Gym Friday night. The Vikes were victorious. See pg 6 for the complete basketball roundup. Editor's note: The P.U.D. man-lift story had the most readership as one single story in 2013. However, the Tokeland Project, which had several stories published, had more of an impact on the ratepayers, and received the most readership overall. 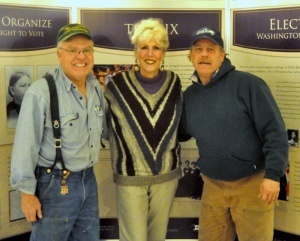 It is the Willapa Harbor Herald's No. 1 story in 2013. Listed are the Herald's top stories for 2013, according to our staff's vote, news stand sales, and input from our readers. The Willapa and Grays Harbor Oyster Growers Association submitted an application to Ecology for a water quality permit to allow the association to use pesticide to control burrowing shrimp at commercial shellfish operations in Willapa Bay and Grays Harbor. North Beach went to South Bend at defeated the Indians 52-34 Thursday night. The Hyaks stayed undefeated at 11-0 and 5-0 in the Pacific League. Naselle held South Bend to six points in the second quarter and just two in the final quarter during a 46-30 win at Koplitz Fieldhouse last Friday night. Katlyn Sawyer paced the Lady Indians with 16 points and 8 rebounds. Raymond's defense held Naselle to 21 points in the first three quarters during a 50-40 victory over visiting Naselle last Tuesday (Jan. 7). Hailee Williams scored 16 points, tore down 10 rebounds and stole the ball 6 times. Raymond clobbered Naselle 48-28 last Thursday at Seagull Gym. Tristan Lund scored 13 points and Rayce Newman and Jayce Freeman netted a dozen markers apiece. Photo by Steve Rogers Willapa Valley's Lauren Friese puts up a shot against Raymond's Cydney Flemetis as she helps her team to a Pacific League win over the Lady Gulls last week. 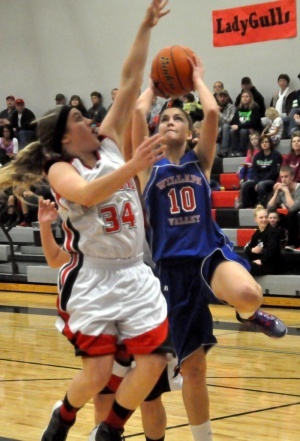 Willapa Valley utilized balanced scoring and decent shooting to defeat Raymond in an early battle for first place in the Pacific League. The Vikings won 52-41 Friday night at Seagull Gym. 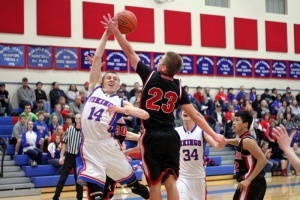 Willapa Valley won a defensive struggle over Raymond 42-33 at Tenoski Gym in Menlo Saturday night.